My husband and I had always wanted to incorporate wainscot and chair rail in our home. Chad Brady, from Prestige Custom Trim, made that possible for us. Our main entry way and foyer look like an entirely different place now. His work was of the finest quality and the final product is amazing. It is exactly what we had wanted, a more finished and upscale look. Additionally we wanted to remove some old cabinetry from our laundry room and have it replaced with some higher quality product. Chad was able to remove and replace the cabinetry, plus add some additional details we would not have thought of, in a matter of a few short hours. The results of this room are just as wonderful. What a difference! I would highly recommend Chad Brady and Prestige Custom Trim to anyone looking to add finer details to their home or who would like to have a completely new look. Our experience was exceptional. We would definitely recommend Prestige Custom Trim. Chad provided upgrades at reasonable prices to give our home charm, elegance and style. Some upgrades he provided were additional trim, crown moldings, wainscotings, custom bookcases and bead board. His workmanship and attention to detail transformed our typical house into a beautiful home. 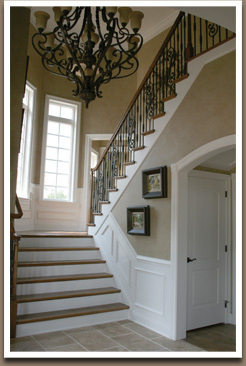 In a matter of several days, Prestige Custom Trim gave the interior of my house an extreme makeover with new chair rail, crown and dentil moldings, fluted columns, trim casing, stair newel/railing, and baseboard. The result was stunning, to say the least. I learned that there is a huge difference between ordinary contractors on the one hand and craftsmen on the other hand, and Prestige Custom Trim squarely fits in the craftsmen category. Their work was of the highest quality, and they performed the work expeditiously. I would have no reservation whatsoever in using them again if the need came up or recommending them to anyone who wanted to add a craftsman-style look to their home. Chad took in charge from the very beginning. He came when he said he was coming. Chad was very professional every time he stepped foot on the job. Whenever there was a problem, Chad would come up with a solution. Overall, we were very pleased with Chad . We would recommend Chad to anyone. Excellent job and a job well done ! !